This stallion is forced to stay light on his feet around this big mare. One minute she naps nose to nose with him, and in the next moment, she sets him back on his heels over control of the air space over a mud hole. Granted, water is scarce, but this was a crabby moment, not a desperate thirst moment. 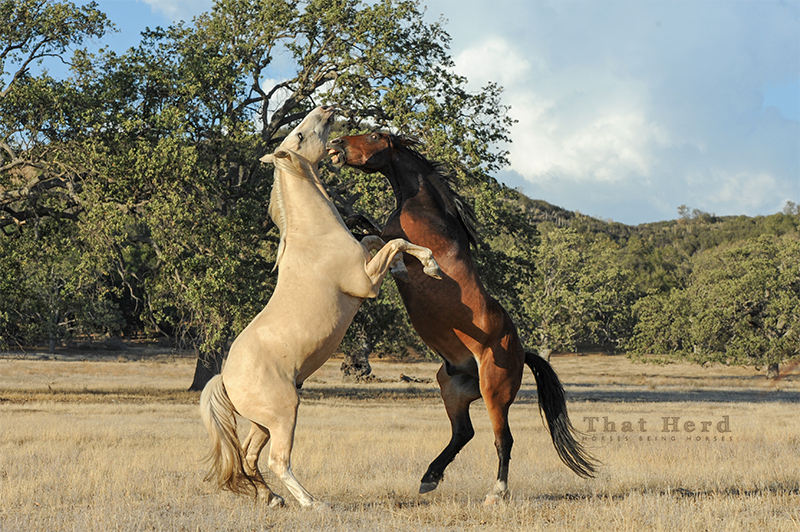 A skirmish breaks out over control of a mud hole between a mare and stallion. I’m adding another picture to honor this valiant mare for giving birth to such a sturdy foal. Large joints and pointy shoulders were no match for the grit of this Super Mare. Not to mention, it was probably raining at the time too. Congratulations to a valiant mare for giving birth the such a sturdy foal. 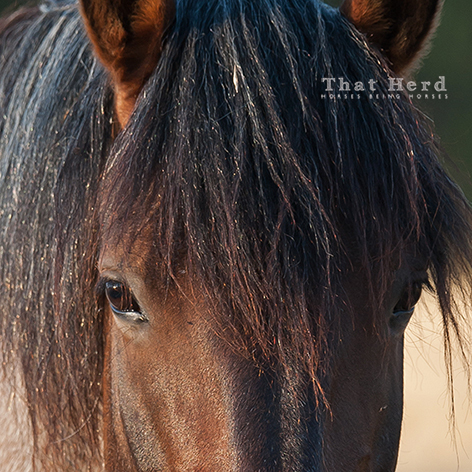 The end of the year brings inevitable reflection, and this mare deserves to be a poster-child to that end. 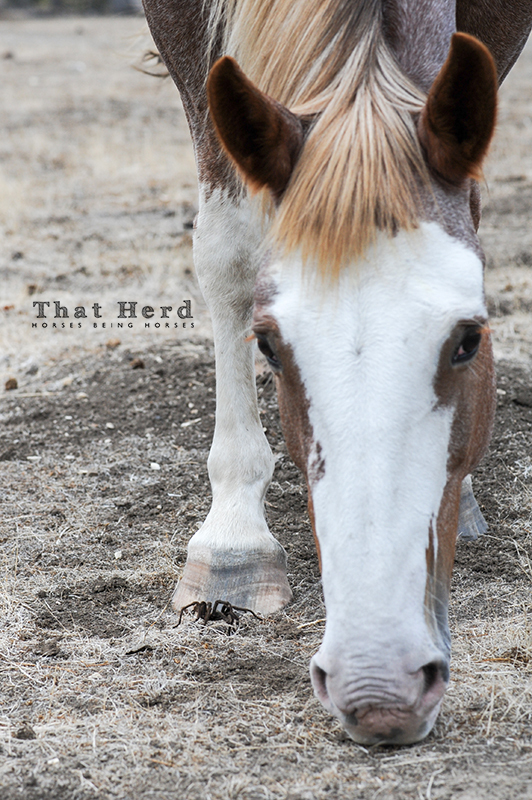 She has suffered through the loss of her foal at only a few days old and then survived a terrible illness. Still in the recovery months, she shows tremendous spirit and bright promise for the new year. Good girl. That indomitable spirit still shows after a challenging year for this young mare. 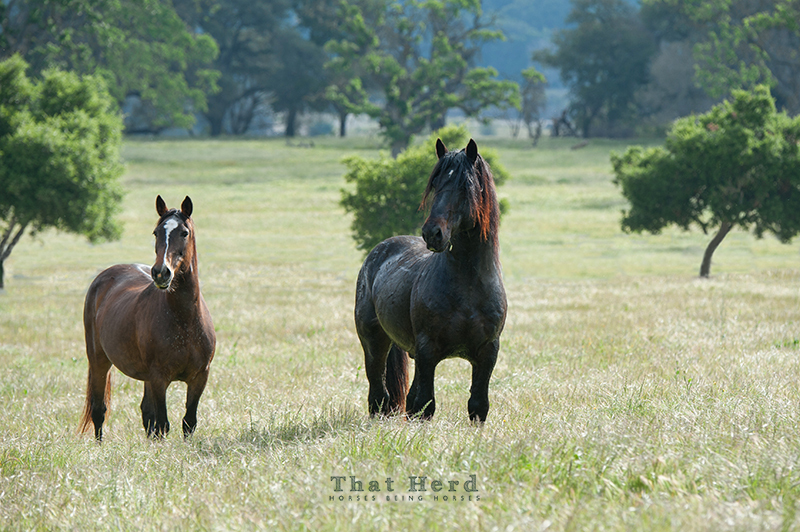 Filly herd mates strike all-knowing expression. A powerful mare emerges from woody terrain to investigate my visit. She is young and strong and good-natured. I think she looks lovely in this setting. 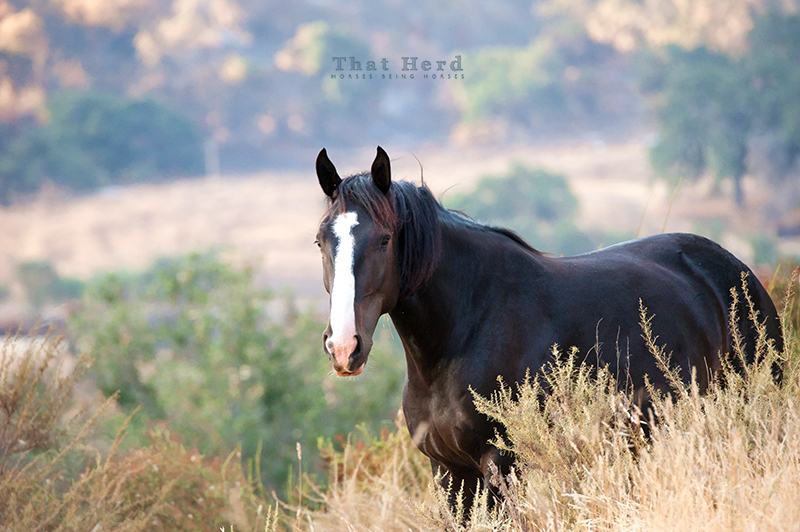 Emerging from a woody area, this mare is framed in scenery. Aurora Musis amica. (Dawn is friend of the muses). There is no heat yet from the sun; the only hour of this day that won’t be hot until well after sunset. It was not cool, just not hot yet. This put a spring in her step, and doesn’t that light make her look pretty?! 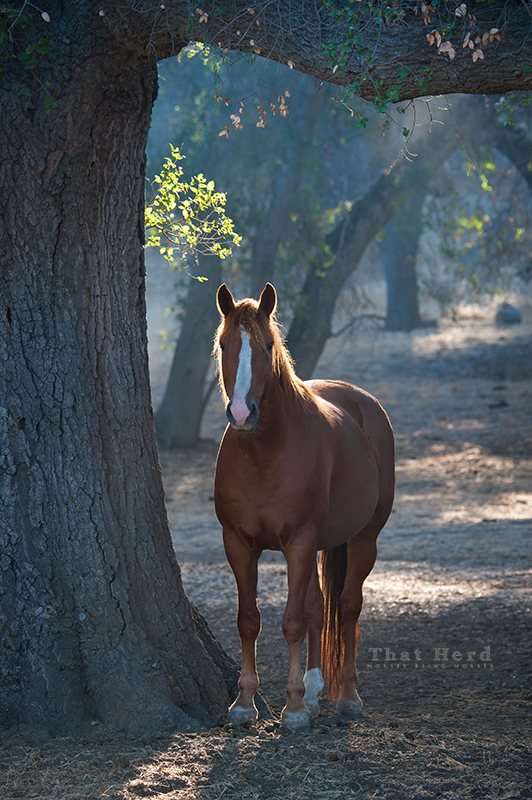 A beautiful mare in the first light of day. I have a lot to say about horses eating thistles when surrounded by other (seemingly better) choices, I just don’t have a lot to say right now. In the mean time, here is a delightful, good-natured mare eating a thistle with plenty of other grasses underfoot. 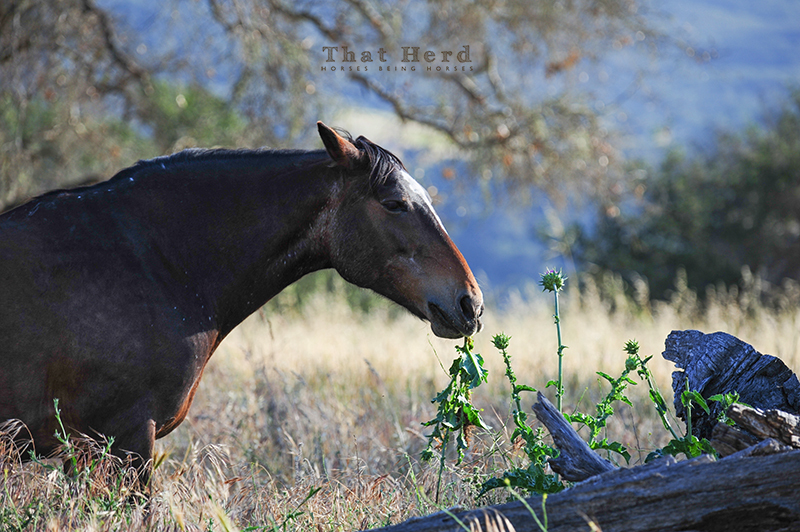 Horses eating thistles when there are plenty of other choices is always a wonder. Warmer days make the pond a wonderful place. 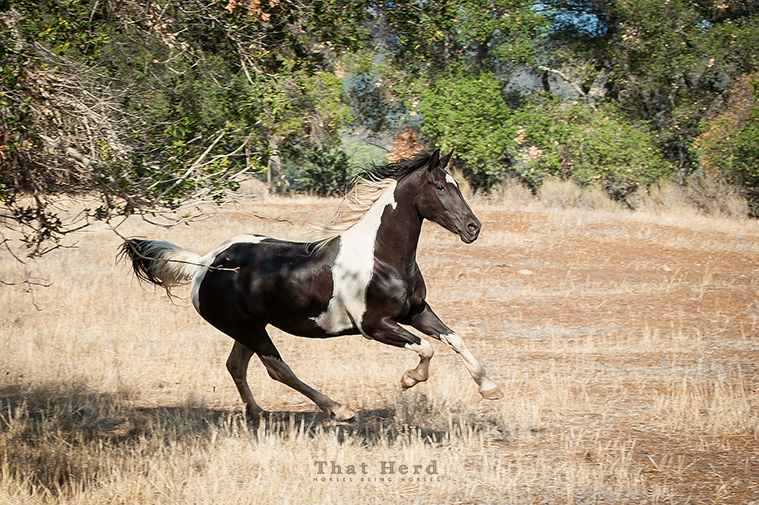 I have taken my time in introducing the That Herd stallion this year. He is a new individual to me, and I wanted to get a sense of what kind of horse he is. At this point, he seems very tolerant of my visits and displays a wide range of attitudes toward the mares. From aloof, to tolerant, to nurturing, to dismissive, he has shown many sides. Granted, I am only observing for very small pieces of time in the grand scheme of a 24 hour day. It is interesting to have observed so many different characteristics in these small moments though. 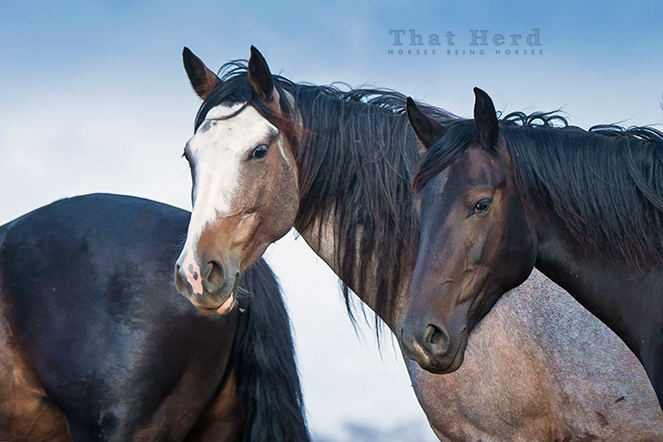 It is evidence of how complex and individual horses are, especially when they have the freedom to interact and express their personalities among other horses. 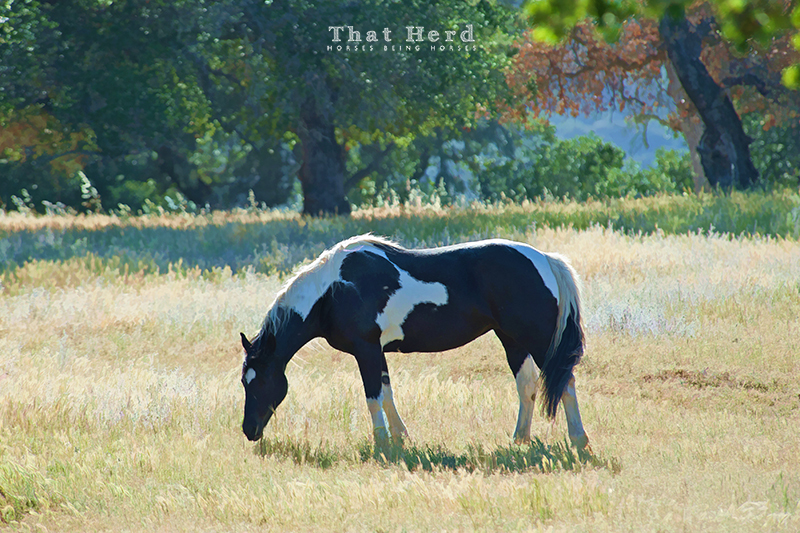 The herd stallion appears quite large in comparison to an average sized That Herd mare. I can take a hundred photos of the same horse, but only very rarely do I feel like I captured a picture of the horse I see in in that moment. The differences in the images are slight, and without anything to compare it to, you, as a viewer would not find fault with the horse’s portrayal. For example, this image spoke to me while several other images that are very similar, did not. 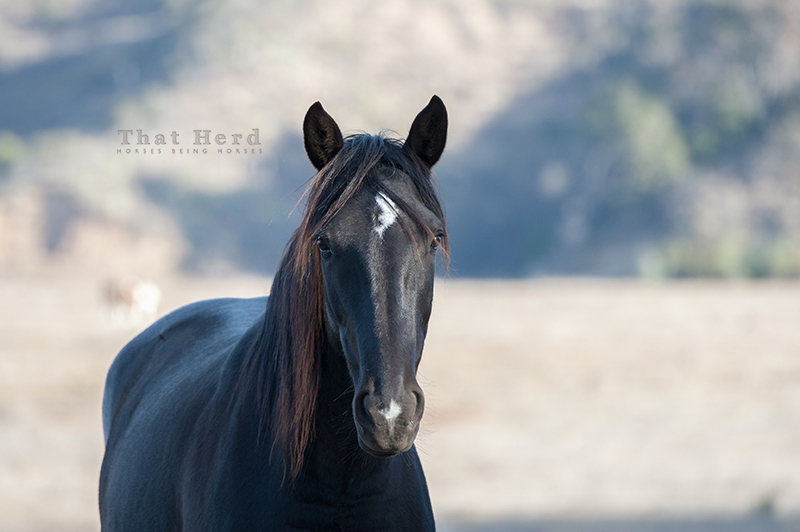 This is a complex young mare, who often disappears in a crowd. She is plain looking and quietly lives among her herd mates. These observations contrast the very real fact that she is an amazing individual with intelligence and fortitude. 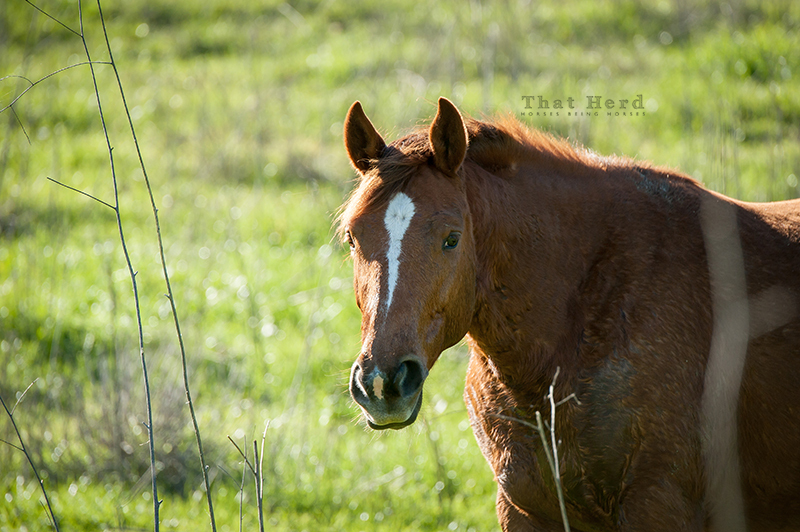 The less obvious qualities of a horse, when captured in an image, are priceless. A young mare considers my appearance. A cold, early morning adventure lead to the discovery of this, and other, beauties. I see lovely imagery of horses daily; often they are stout steeds with thick manes and tails billowing, flashy markings, arched necks, and animated limbs creating instant dreamy joy for any horse lover, myself included. 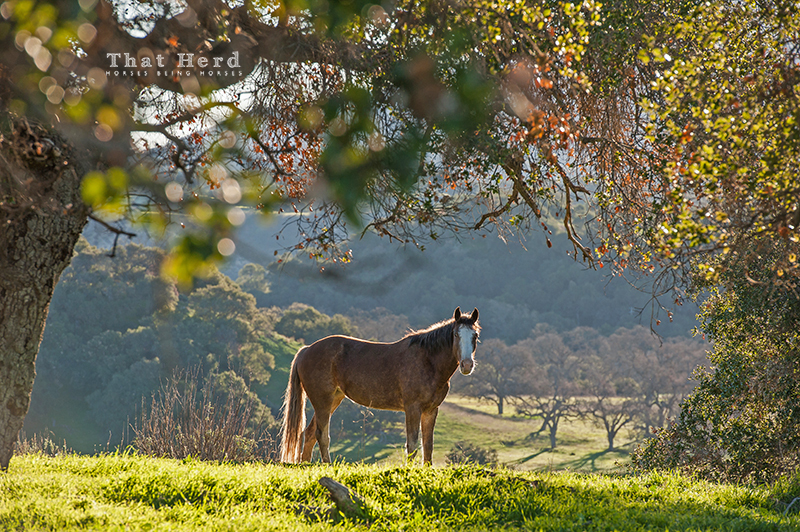 The same effect can be achieved by a common horse in quiet repose in a familiar local setting. Horses are amazing. An early morning meeting with an curious filly. 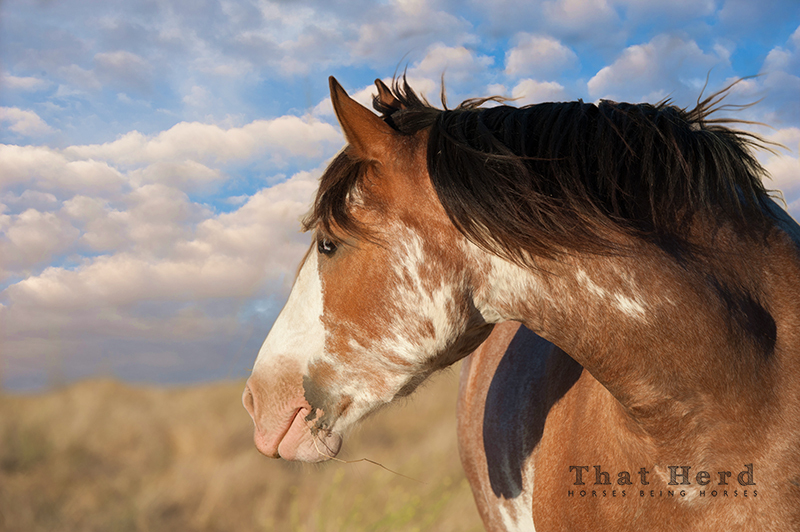 A painted mare casts her gaze over an improbable view. Disrupt, interfere, impede. This is what she does. 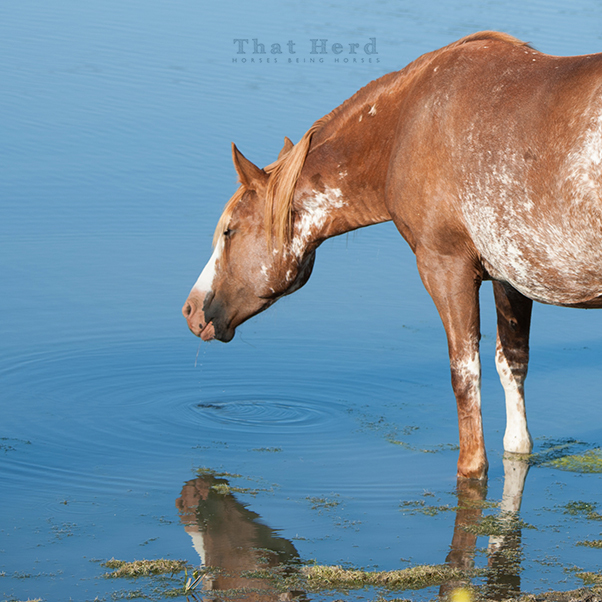 This mare shows signs of intelligence beyond the norm for a horse. A handful of blizzard snow and black as a high-noon shadow. Horses evoke such poetry, even a common horse has the potential to shine in moments of spirited eruptions; they just have that gift within them. To witness a triumphant horse is a guaranteed mood elevator. This mare was like that on this day–a gift–she gave repeated fleeting glimpses, and then she was gone. 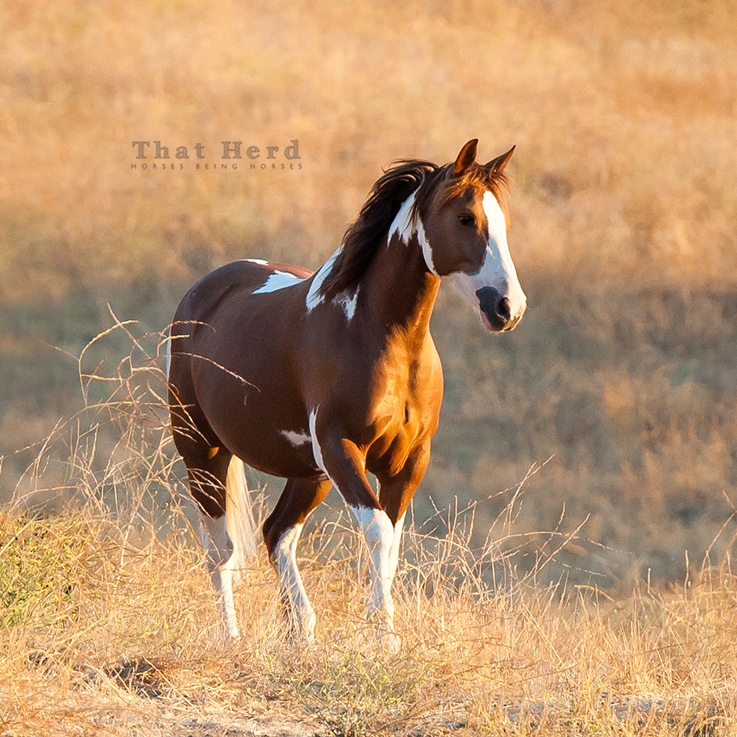 At ease and high-spirited, this pretty mare gallops around the other mares in a wide circle. I was surprised this meandering mare even noticed this passing tarantula. She briefly lipped the spider, and passed over it, probably narrowly avoiding a painful bite. Once cast aside, sheer luck spared the tarantula a smashing from her stepping hooves. After this hoof, then another, the spider negotiates a few other passing mares, is spared again and again, and goes about it’s charmed tarantula life. 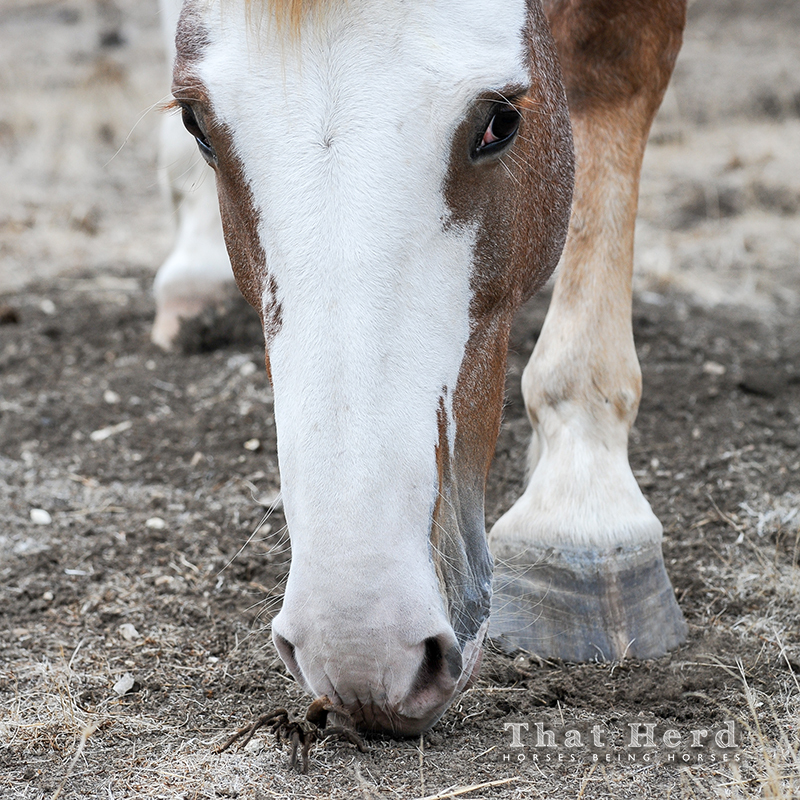 A colorful mare investigates a passing tarantula. 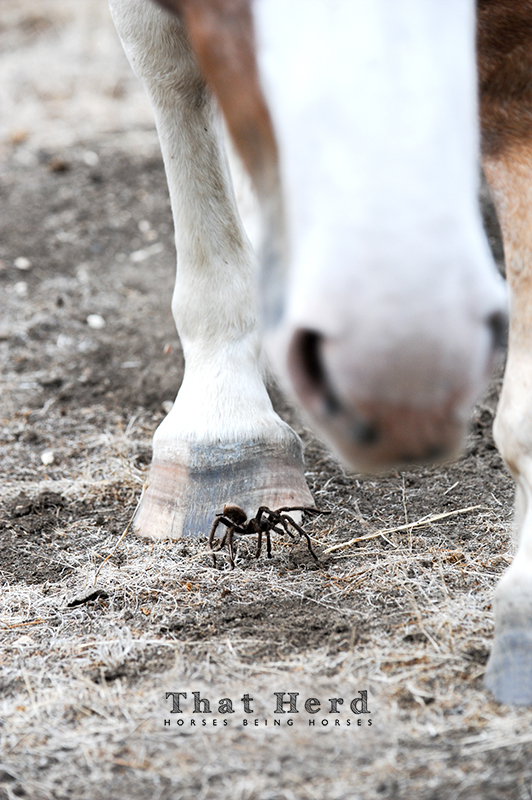 After discarding a tarantula with a flick of her lip, the spider is in grave danger from this mare’s walking hooves. Oh dear, danger, tarantula, danger! A mare nearly steps on a passing tarantula. 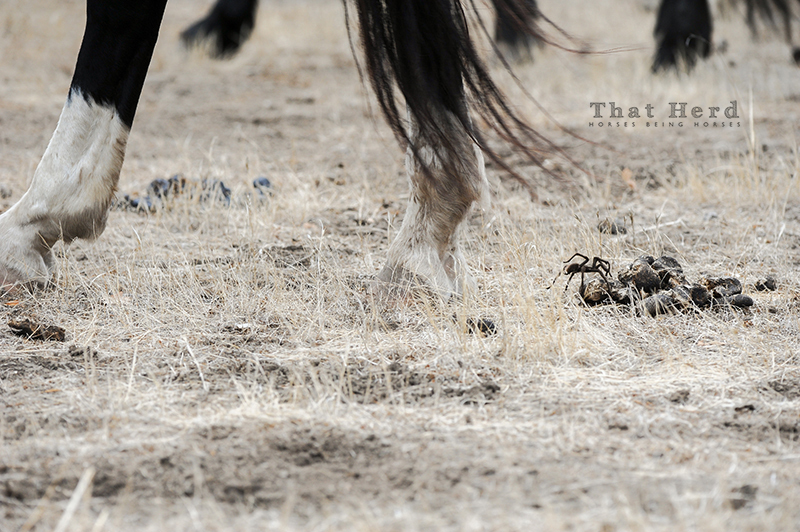 As many mares pass, this tarantula dodges hoof after hoof. Even in small doses, nature changes how we feel. When was the last time you went outside and did something you remember? 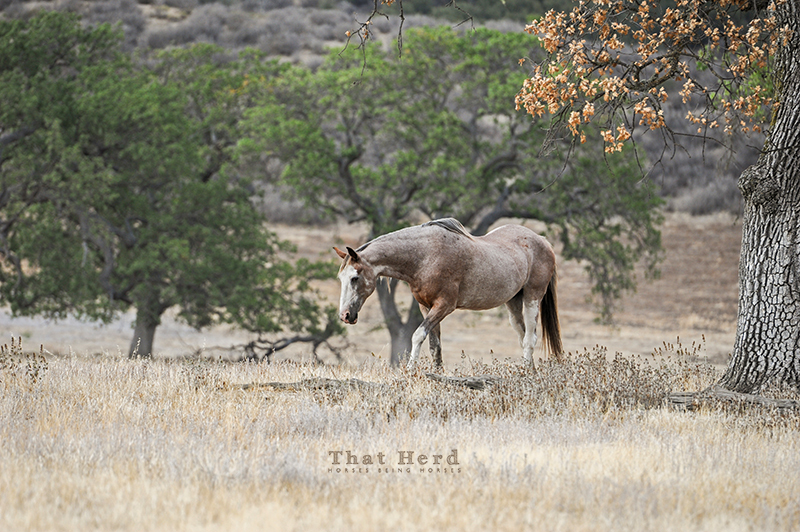 Soothing natural late spring beauty of a That Herd mare. 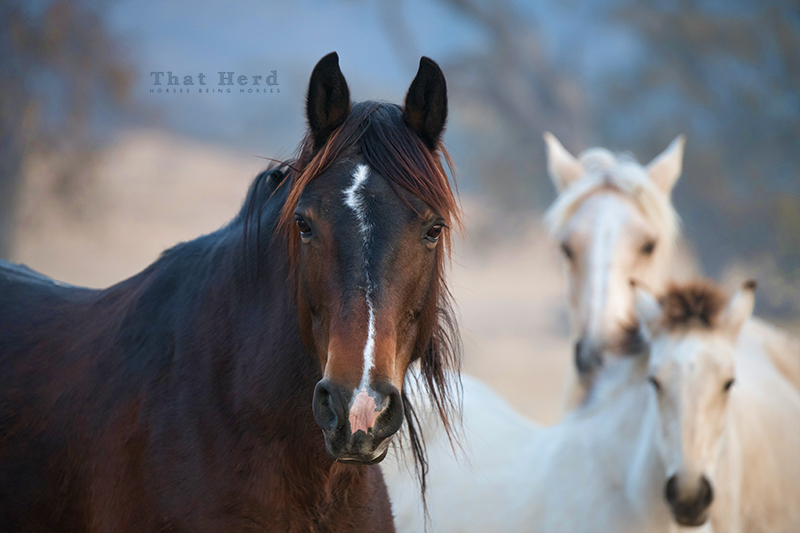 Mature horses filled with youthful behaviors and an old, old mare who manages her energy all live together within That Herd. I’m told this old mare has to be over thirty-five years old but she still manages to live a healthy life. 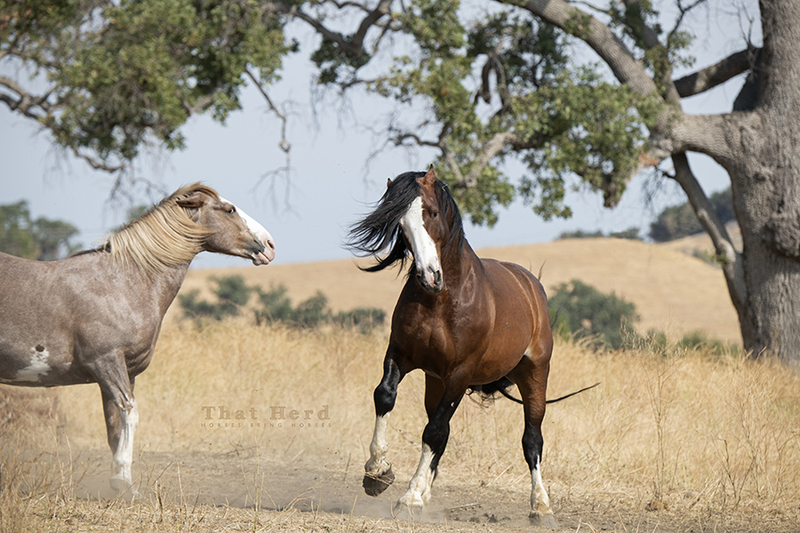 Young and strong, these mature horses are filled with feel-good energy and engage in mock battles. A previous blog post or two has mentioned this unusual event but I have not shared this image yet. In the first hours after giving birth, a new mother (her first foal) is in a standoff with an old mare who is intent on stealing her newborn filly. The new mother was distracted with not feeling well in connection to passing the placenta and was lying down quite a bit. 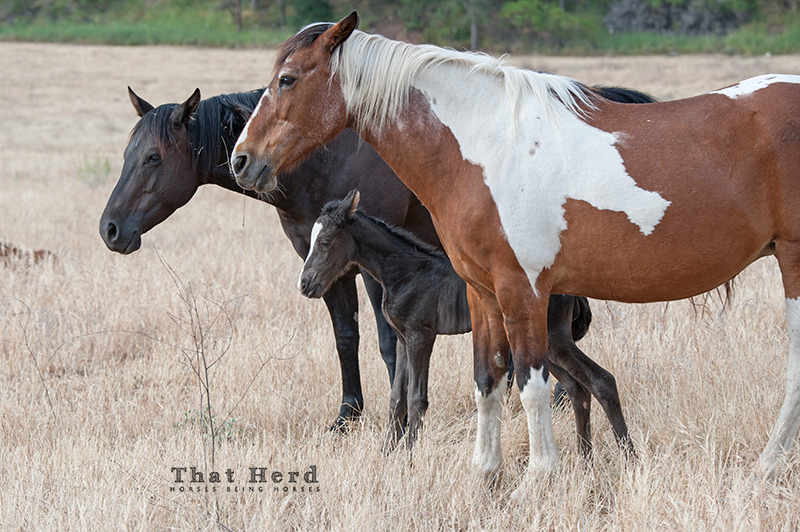 The old mare, who has not had a foal of her own in years, swooped in and took ownership of the newborn. 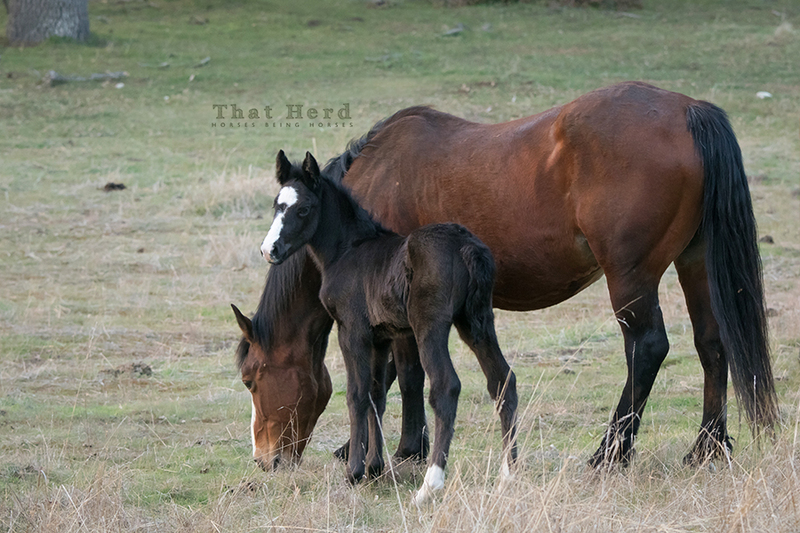 The newborn was not equipped to understand the situation and began bonding with the old mare, who was standing and attentive, even attempting to nurse from the old mare. In this image, you can read what’s happening on each horses face. Apprehension from the disheveled black mare as she tries to unravel what’s happening; this is her first foal, so she has no experience with motherhood. Some distress and fatigue for the newborn and resolute defiance from the old paint mare. After much confusion and some human intervention everything was made right. All is well for the new mother and her foal, and the old mare has accepted that she failed (for the good of all) in her attempt. A standoff between a new mother and an old mare intent on stealing her newborn baby. Observing the morning light first touching the day, cold and golden, degree by degree, is the most amazing rejuvenation. A day that looms, full of mindless obligations or dreary business is pushed far back when a dawn of brilliance shines in on your soul and makes everything clean and clear and calm, if only for a few minutes. Even the suspicious eye of this startled filly did not lessen the sparkle and song of such a day’s beginning. Be somewhere wild before the sun rises once in a while and your perspective will change. That, I can guarantee. Morning light bathes a filly on a crisp January morning.